Do you need a break from your regular reading routine? At my house we love to read, but I sometimes need to take a break from the thick chapter books that I read aloud to my older kids (ages 11, 9, and 7). We all have a bit of spring fever and I’m wanting to infuse some fun into our day as we inch toward the end of another semester. What’s the perfect way to reset your week and shake up your semester? Spend a week reading bright and colorful picture books! Yes, I am advocating to read picture books even with your older children. My oldest daughter (age 11) still enjoys curling up with me while I read picture books aloud. I hope she never grows too old to do that. And since it’s almost St. Patrick’s Day and I love to celebrate the holiday by reading lots of fun and silly leprechaun books. If your house needs a splash of green and a lot of laughs, check out these books for the holiday. And there are even a few nonfiction titles, so you can learn about the man behind the holiday, St. Patrick himself. I couldn’t resist making it a little bit educational! This book is the perfect introduction to the man behind the holiday. It even has information about the symbols behind St. Patrick’s Day. This is such a fun and cute book about some leprechauns who are on a journey to put the pot of gold at the end of the rainbow. However, they can’t help but cause a little mischief along the way. If you’ve ever wanted to start the tradition of setting a trap to catch a leprechaun then you need to explore this book! It’s a fun rhyming book about the quest to catch a leprechaun for St. Patrick’s day. You’ve heard of the old lady who swallowed a fly? She’s back for St. Patrick’s Day. This time she’ll swallow things to make a perfect rainbow. This book is a play on the popular Christmas poem. In rhyming text it tells of two children who attempt to catch a leprechaun on St. Patrick’s Day. Will they succeed? Here’s a St. Patrick’s tale by one of our favorite authors. In this story, the laziest man in Ireland, Jamie O’Rourke, depends on his wife for food. After she’s injured, she fears they’ll starve to death, but luck is on their side after Jamie frees a leprechaun. 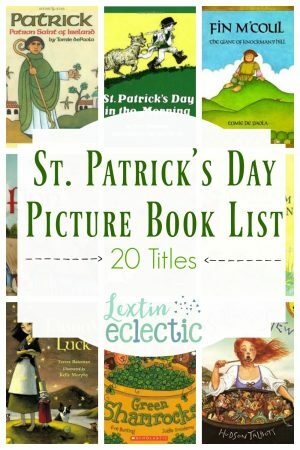 A rhyming book about St. Patrick’s Day, this selection is perfect for younger ones. The illustrations are colorful and cute – I just hope you can pronounce “shillelagh” as you read! Little Jamie sets out to prove that he is big enough to walk in the St. Patrick’s Day parade. This sweet story is highlighted by Jan Brett’s simple but beautiful illustrations. Who is the best harpist in the land? Tom’s only hope to beat the leprechaun is through some trickery. And as you read the story have fun searching for the hidden shamrocks. Tim and his wife are down on their luck but their fortune changes when Tim meets some wee folk who promise to give him some treasure. Now, if Tim will only learn to stop boasting to his neighbors! Kate sets out to bring peace her village but gets herself into deep trouble. The only way she can save herself and her village is through a story – one that is full of Irish blarney. This one is a funny tall tale! Poor littler Tucker the dog is not having a good day. After he rolls in a patch of clover belonging to a leprechaun, his luck is changed. This one is a cute choice for young ones. It’s a sweet little story. This is a traditional Irish tale about a woman who saves her husband from the fiercest giant in all the land. While this tale is kept true to the original version with the fighting between the violence, the beautiful illustrations help soften the story. The Leprechaun King has stolen all the luck in Ireland. Thankfully, Fiona is clever enough to outwit the king and bring luck back to the land. This book is out of print currently but it’s such a fun book by another of our favorite authors. It’s the story of a rabbit who plants shamrocks for the St. Patrick’s Day parade, but suddenly his entire pot goes missing. This is a great nonfiction choice for older children. It details the events of St. Patrick’s life from his capture by the British to his dream to share his faith with all the people of Ireland. Here’s another fun leprechaun book, but it’s out of print. If you can pick up a used copy, you’ll enjoy the story of Tom who thinks he can outwit a leprechaun into revealing his hiding spot for the pot of gold. Tom forgets that leprechauns are full of tricks. The lazy little girl in this story refuses to do her chores. The only work she will do is to hunt for a leprechaun. She does catch a leprechaun, but as he sends her on the hunt to find his gold, she’s actually getting her chores done. This story emphasizes the importance of hard work in a fun way. While leprechauns are lucky on St. Patrick’s Day, every other day of the year they don’t make for pleasant neighbors with their noisy job of making fairy shoes. One neighbor sets out to outwit them and proves that leprechauns aren’t the only ones who can play tricks. Finn McCool is the largest giant in Ireland, but he’s not very smart. He goes on a journey to find a salmon that is said to possess the wisdom of the world – and he learns a few things about himself in the process.